If you are entering the world of photography or you want to ditch the point and shoot camera, a DSLR camera is the next logical choice. DSLR cameras do not come cheap. Investing all your hard-earned money on a model that costs thousands of dollars may leave you without the best accessories to accompany your new DSLR camera. That’s where a cheap DSLR camera comes in. It does not compromise on the quality it’s only that you will get fewer features compared to a high-end DSLR camera. So, what is a DSLR Camera? The large the sensor, the higher the quality of images you are going to capture with a DSLR camera. Comparing the sensor size of different cameras regardless of the megapixels will give you a good idea of the quality of shots.Sensors are either CMOS (Complementary Metal-Oxide Semiconductor) or CCD (Charged Couple Device). CCD were first considered to be superior to CMOS but thanks to the likes of Canon and Nikon, CMOS sensors have equal or better quality as that of CCD sensors.You will encounter sensor sizes like full-frame (36mm x 24mm) which is equivalent to the 35mm Negative to APSC (23.6mm by 15.8mm), APS-H (28.7 x 19mm), Four Thirds (17.3 x 13mm), and CX (1inch). After you have zeroed in on the perfect sensor size, you will also need high Megapixel number. High MPs give you the versatility of formatting a photo like when enlarging or cropping it. DSLR cameras can have megapixels as small as 5MP to as high as over 24MP. Finding the right size means you will get good prints, zoom in, and crop your pictures without distorting the image.Note that a high MP camera will shoot images that take up more space in your SD. DSLR cameras come with an LCD and an eye-level viewfinder. It is important that your DSLR camera comes with a bright viewfinder so that your focusing is clear and you can see images from corner to corner. The chances of ending up with a blurry image even when your hands are the steadiest cannot be understated with a DSLR camera. That’s where image stabilization comes in. It prevents the occasional blurriness that usually happens when the shutter has to stay open for longer. This is in situations like shooting after dark or in bad weather. This method uses gyroscopes on the camera body instead of stabilizers on the lens. This method is common as it senses when the image moves and it is then moved to the sensor for a clear shot. This is a more advanced way of shooting clear images as it involves changing the camera settings after you capture the image. It includes features like Intelligent ISO which automatically adjusts itself to a higher ISO when the camera detects a moving object in low light. DLSR cameras have either inbuilt flashes or have the allowance of attaching an external flash. An inbuilt flash means you will not be adding any weight to your already heavy camera. It allows you to take more gear and travel light if you are taking a hiking trip or a backpacking trip. The beauty of DSLR cameras is that they do not suffer any lag. The point of autofocus makes it essential alongside the speed as the camera will detect the image for you and all you have to do is press the shutter button. Why we like it: It is an entry-level camera with superior features compared to cameras in its class. It boasts simplicity in operation with stunning image quality. 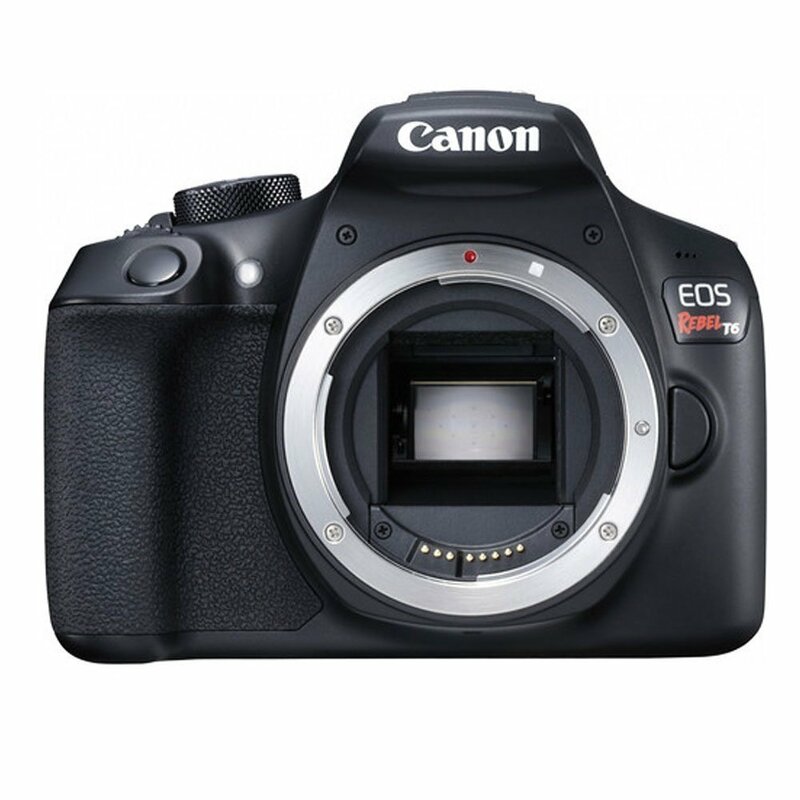 The Canon T6/EOS 1300D is an entry-level DSLR camera that is a step up from a compact or smartphone camera. It uses an 18MP APS-C sensor which is in the midrange size for capturing clearer and reasonable quality photos. The camera is compatible with a wide angle lens and a telephoto lens which is included in the package. It has a smooth learning curve which is what you need when you are starting out. This way, you can move up with cameras from the same brand as you master more and more functions. The camera offers a 9-point AF module and 3fps burst shooting. With 1080/30 video capture feature, you can start experimenting with this camera by capturing the best aspects of nature. Canon T6 has a beautiful representation of color and white balance. Everything will appear in its natural state as long as there’s enough light. The camera offers ISO from 100-6,400 which is expandable to 12,800. Its color noise is not noticeable at ISO 800, but once in the high ranges from 1600, it becomes pronounced. This camera supports Wi-Fi connectivity. You can wirelessly transfer files to a smart device where you can select which ones you want to keep or delete. Its battery life is decent as it can give you up to 500 shots on one charge. Canon EOS T6 includes lots of accompanying accessories that include 32GB and 10GB flash memory cards, camera case, lens protector, pocket tripod, Xit tripod, remote shutter release, etc. Canon T6 EOS, 1300D DLSR Camera, has its best fit in the hands of a beginner. It can offer only so much when you want to spend as little as possible on a DSLR camera. It produces decent photos and videos buts it has no advanced functions to propel your photography to higher heights. Why we like it: It may not have all the latest features, but what it does, it achieves high levels of perfection. Nikon D3400 is a decent entry-level camera that features a lightweight body. You could mistake it for a compact camera, but its features are nowhere close. The camera is built around a 24.2MP DX-format CMOS sensor that does not have an optical low-pass filter. This is an advanced sensor much better than the D3300 as it performs with excellence in low light. It has an 11-point AF system coupled with 5fps burst shooting. It is powered by EXPEED 4 image processor which makes every photo look professional and delightful no matter the shooting conditions. All thanks to Nikon’s 3D-tracking technology. Although it does not offer 4k video shooting, its 1080p videos are complemented by 60fps frame rates. It makes it fast and easy to focus on moving images without instances of choppy images. It has, however, omitted a microphone port which is crucial to video lovers. Instead, you will be using its inbuilt monoaural microphones. Its ISO range is much more extensive than Canon’s T6 coming in from 100-25,600. It is a wide expansion which it executes excellently, for the most part, except for the high range from 12,000. Nikon D3400 works in harmony with your smartphone using the always-on Bluetooth function. It provides the seamless transfer of images to your smartphone so that you can share your best pictures with family and friends. With SnapBridge wireless technology, it transfers photos automatically to your phone as soon as they are captured. SnapBridge also works hand-in-hand with Nikon’s cloud storage where you can back up your photos and share them widely. Nikon D3400 costs a little bit higher than entry-level DSLR cameras, but this is because it has more advanced features. On top of being lightweight, the camera is easy to use and operate for the beginner. It is simple to navigate throughout the functions to ensure that you get the most out of your purchase. Why we like it: It is a full package with all the components for starting in photography. The lenses are interchangeable which is one of its attractive features for the price. 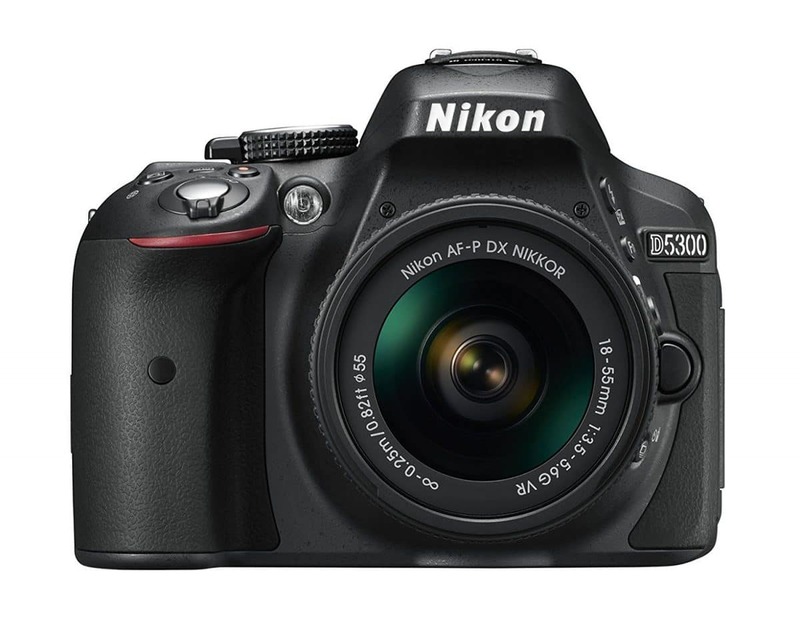 Introduced in 2014, Nikon D3300 represents a friendly DLSR camera for the beginners. It has most of the features on the Nikon D34000 except for having a microphone port, and the inclusion of an optical low-pass filter. 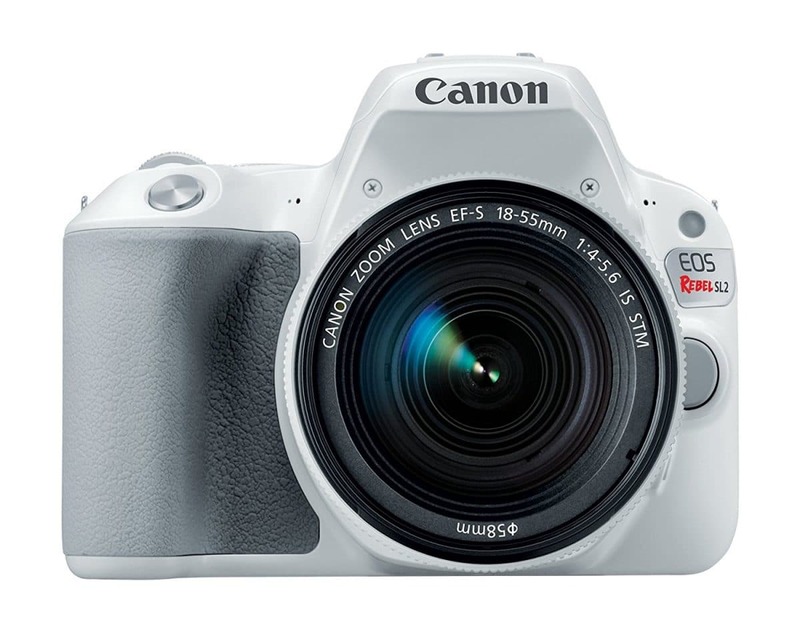 Its 24.2MP DX-format CMOS sensor allows capturing of sharp-detailed images day and night. It may not be the best for night shooting but we are talking entry-level so what you see is what you get. This camera allows you to take stunning full HD videos at 60fps. Its mic port means you get to capture better sound to make your videos more audible and fun to listen. We like that it uses an optical stabilizer that will come in handy to freeze images in real time and prevent shooting of blurry photos. This camera is an excellent option if you are about nice quality of images. With the active D-lighting, the camera will preserve the best colors of your images whether in bright light or low light. It provides 5fps burst shooting and 11-point AF system. It is not that advanced, but you are sure to capture breathtaking photos. If you are shooting in a less than perfect environment, you can always apply one of the six scene modes. This way, the lighting will be perfect, and you will not end up with smeared photos. The camera can also select the most desirable scenic mode just by choosing the auto-mode. So next time you are unsure, let the camera do all the work, and you get to keep all the credit. The optical viewfinder on this camera offers 95% field of view. You will see everything in your field of view so don’t worry about capturing something you did not intend. It remains bright and clear for days. With an ISO range from 100-12,800 expandable to 25,600, this camera remains versatile for a wide range of lighting conditions. Nikon D3300 has basic features in photography. It is user-friendly with an excellent sensor for bright and decent quality photos. Its video recording capability ranks high for the cost. Its quality is primarily on every photographer who is all about shooting great images instead of having trending features. Why we like it: It has a smooth feel with all the buttons at your fingertips for one-handed operation. When you are looking for a cheap DSLR camera and are not willing to shell out over $1000, getting a model that has a solid performance at a certain price point is critical. Canon Rebel XS is one such camera that will leave you more impressed than you would have anticipated. This model is designed for portraits and large quality prints. With a 10MP APS-C CMOS sensor, this model beats most cameras with such a resolution. It captures decent still images thanks to its tonal range and high clarity. It is 2018, but this camera is not ancient in the world of photography. It has a fixed 2.5-inch screen and a 7-point autofocus system couples it. But the AF can be annoying because of the red spots that flash briefly when the image is in focus. This camera can, however, shoot in 7fps when shooting JPEGs, but it gets as low as 4fps in RAW mode shooting. Canon XS has a live view mode where you can zoom the image manually or 5X and 10X. You can view the image directly which is much better than with a point and shoot camera. It also comes with a self-cleaning sensor unit. It prevents dust collection on the imaging sensor and the front low-pass filter. This feature protects the inner components from damage. If you are looking to wet your feet in photography familiarizing yourself with the specs of a DLSR camera will come in handy as you progress to higher levels. With the Canon Rebel XS, it lets you have the feel of a button camera and not what you would usually use with a smartphone. The resolution is limited making it ideal for portraits and print photos. Why we like it: It is a compact and portable DSLR camera with a wide variety of compatible interchangeable lenses and a touchscreen LCD. 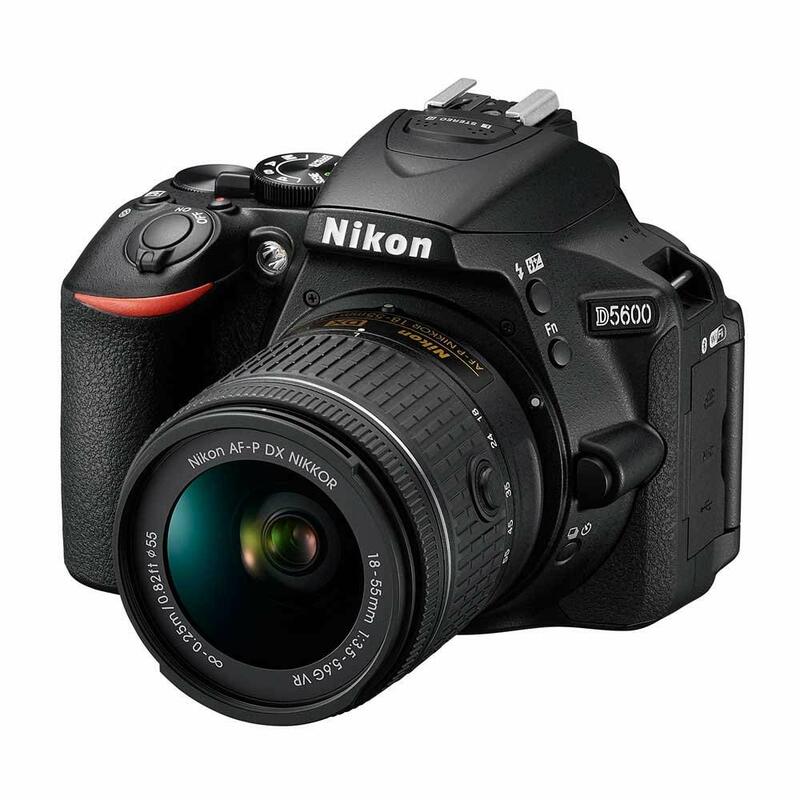 Nikon D5600 is an advanced level DSLR camera that has more to offer regarding resolution, handling, and imaging. The camera uses a 24.2MP APS-C CMOS sensor to deliver highly-articulated images. It is built without a low-pass filter to give more details in every picture. With a 39-point autofocus system, the camera gives you more points to see and use before you press the shutter button. It has 9-cross-type points, and it supports 5fps continuous shooting. 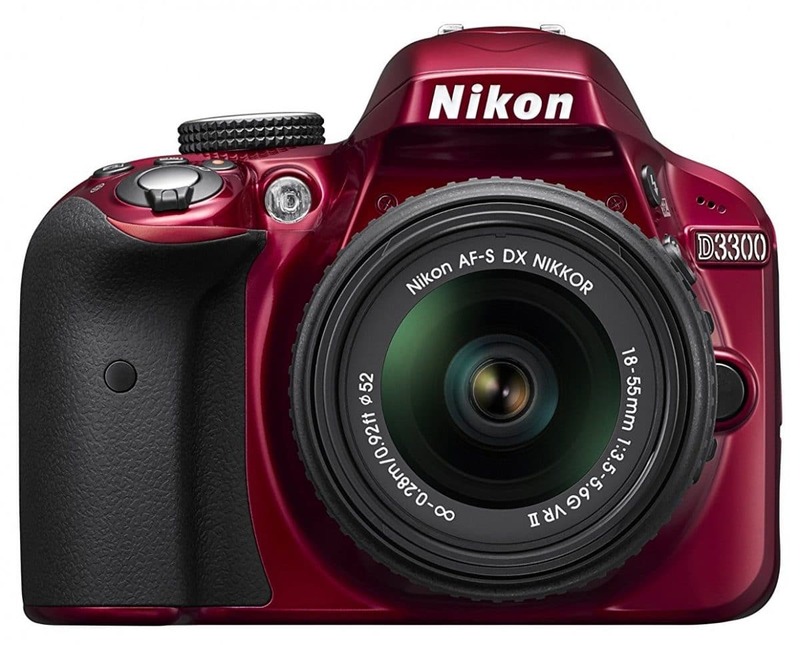 The camera uses Nikon’s EXPEED 4 image processor which is typical of the D3 and D5 line in Nikon. But this camera ranks top of the list when comparing all Nikon cameras. One of Nikon’s D5600 notable features is the vari-angle touchscreen LCD that is 3.2 inches wide. It has a crop function and toggling between images has been made it easy thanks to the frame-advance bar. Its optical viewfinder offers a 95% field of view. You will have a bright and clear view to help capture everything you have in mind. Its video capture is still in the entry-level as it is full HD (1080) with frame rates from 24 to 60fps. Thankfully there is a microphone port at the side of the camera. It is useful when you want to shoot watchable videos with great sound. Connectivity on this camera has been taken a notch higher. It supports Wi-Fi, NFC, and Bluetooth technology through SnapBridge. You can receive photos on your tablet or your phone in between shots. Its Bluetooth connectivity supports up to 5 users. Nikon D5600 has lots of inbuilt camera features like HDR imaging to produce images with a high dynamic range. It is every photographer’s favorite feature since it showcases a high skill level. Nikon D5600 is an impressive model that oozes quality and outstanding features. Whether you are a professional or a beginner, this camera provides excellent usability in its imaging and handling. It gives you powerful performance that will bring life to every photo and video capture. Why we like it: It is built for the enthusiast photographer looking for something more in an entry-level DSLR camera. It is good in real life as it is on paper. Coming in a white color, you may be scared that after a couple of years your lens will be dirty and the body will have yellowed from greasy hands. But that’s not the case with this camera. It can maintain its sleek exterior for many years in good condition. On top of that, you have grippy sides that help to hold and operate the camera using one hand. 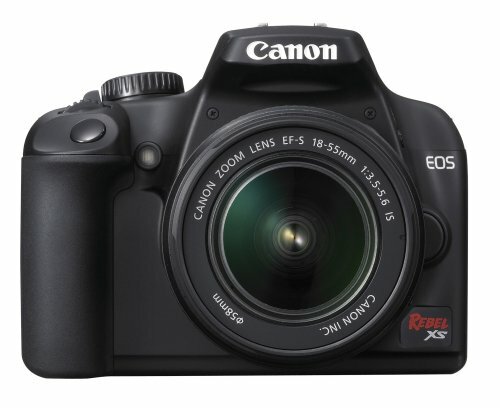 Canon EOS Rebel SL2 has a 24MP APS-C sensor which fits in a compact-sized camera. Except for capturing highly-contrasted images with accurate color rendition; it competes exceptionally well with its mirrorless cousins. The camera supports Canon’s line of lenses so you can interchange them to cover all your shooting needs. This camera comes with a fully articulating screen. It allows you to shoot in different angles and it even has a selfie mode to spice it up. It is a touchscreen which allows you to do everything you want with a touchscreen like cropping and zooming. Canon SL2 shoots in full HD at 60fps. It provides an inbuilt mic and an option for an external mic. This is good news to vloggers and video fans as it will come in handy when you want to post great videos with nice audio. And consequently, you are bound to get more views and grow your vlog. This camera will connect via Wi-Fi, NFC, and Bluetooth. Sharing photos and videos is now as easy as pairing your devices and posting your favorite moments on social media. Canon is a remarkable design that gets you excited thinking of all the shots you could make with it. Its picture and video quality lines up with the best high-end DSLR cameras. You get to enjoy lots of connectivity options, dual-pixel autofocus, and exceptional low-light performance. Take this camera to all your outdoor excursions and bring home your best memories. 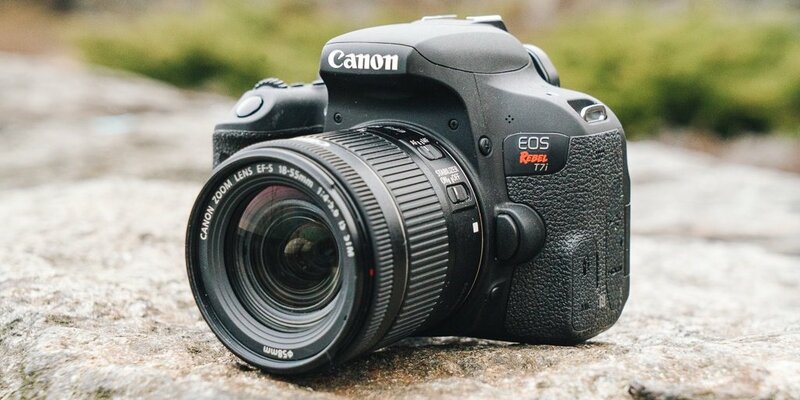 Why we like it: It is as small you can get with a traditionally shaped DSLR camera. It has stepped up its features to match top rated DSLR cameras. Canon EOS Rebel T7i is a powerful entry-level camera with few limitations. It has some significant updates like the 24MP APS-C CMOS sensor that has a 39-point autofocus system and dual pixel autofocus. It will focus fast and smoothly allowing you to capture the best aspects of a scene. The dual-pixel autofocus is useful for video since it prevents marred images. The camera focuses at speeds of 0.03 seconds. This feature provides for detecting how far an object is; thus guiding the lens where it should focus for still images. Images will always be still making it ideal for shooting at a sports event. This camera also uses a DIGIC 7 image processor to help produce noise-free images that are brilliant and lifelike. It uses a 45-point all cross-type autofocus system in its optical viewfinder. It shows you can shoot pictures at any distance without experiencing any lag. When you think of casual shooting, a mirrorless option is a nice pick, but for the outdoors, you will need a camera like the Canon T7i because of the long battery life. It can give you 600 shots on one charge which is much better than with a mirrorless camera. We like that this camera has a guide system that makes it easy to learn the controls. This feature is essential since it allows any beginner who has no idea about photography to learn the controls in a simplified manner. 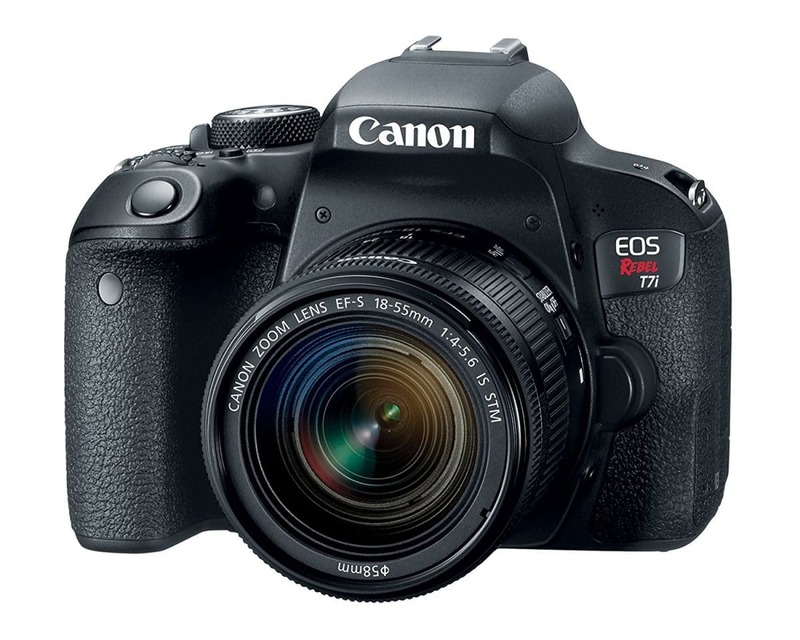 Canon T7i is a welcome entry-level camera with some of the best-advanced features. It has a sophisticated graphical interface and an intuitive touchscreen that will definitely appeal to new users. Single command dial makes it hard to adjust the shutter speed and aperture at the same time in manual mode. Why we like it: It is best for shooting moving images making it a good pick for live events. Durability is an important factor in any camera. Pentax brings their A-game to this camera ensuring that you can use it in extreme conditions without damaging any of the interior components. 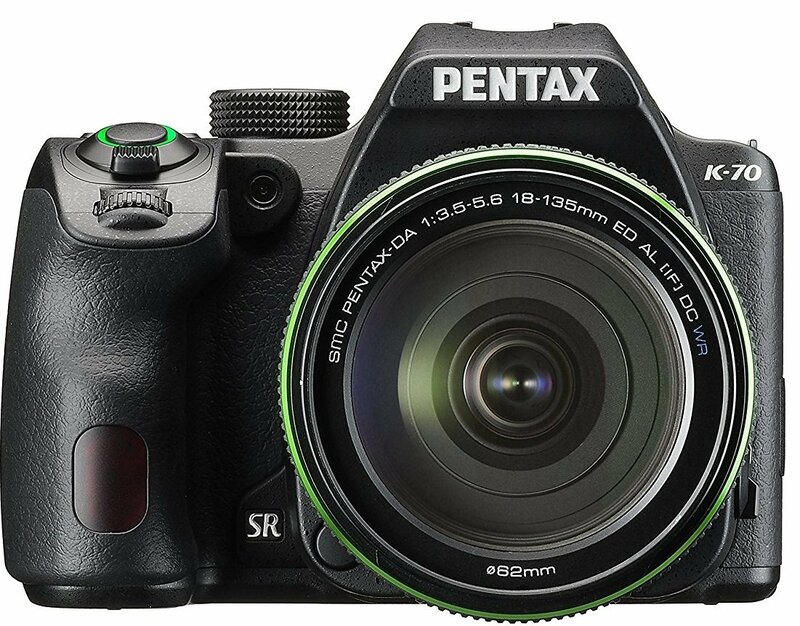 Pentax K-70 is an upgrade of the KS2 bringing you a 24MP APS-C CMOS sensor with on-sensor PDAF. The camera uses a PRIME MII image processor to provide brilliant images that are worth bragging to your followers on social media. It has its clever shake-reduction in-body image stabilization as is its take away point. You will never experience blurry shots when capturing moving images like girls dancing on a stage or antelopes running in the wild. It has a 3-inch vari-angle LCD monitor, so you can shoot from a high or low angle. It provides different LCD settings such as the outdoor view setting and night vision. This feature offers improved imaging in varied light conditions. Since it omits an anti-aliasing filter, the camera can provide sharper images with lifelike resolution. This camera has both the digital controls and the button controls. With the external controls, you don’t have to toggle through features on the LCD screen, you just dial in, and you can operate it fast and easy in manual mode. Pentax K-70 is a highly-competitive cheap DLSR camera. It is fast, accurate, and lots of fun to use. Its AF is significantly faster than with other models in its class so you will be successful while shooting birds, animals, and other moving targets. It will give you serious value for money if you are a beginner but not so much for professional photographers. Why we like it: This camera has both GPS and Wi-Fi support. It can stamp locations on your photos to give you an excellent way of remembering your trips. 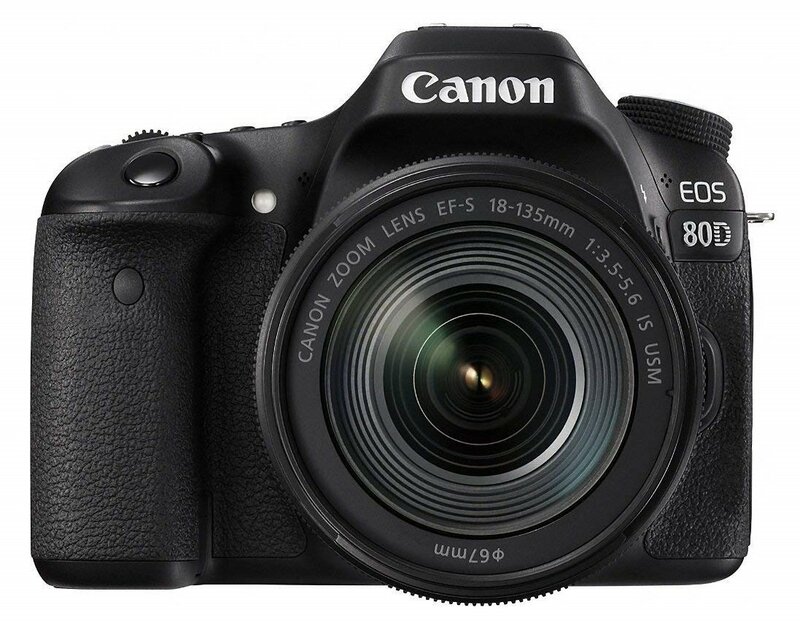 Canon 80D is a top of the line DSLR camera that hits the top dollar in our price range. Nearly all its features have been upgraded over the Canon 70D. It is equipped with a 24MP APS-C CMOS sensor powered by a Digic 6 processor. This model showcases some interesting features including a 45-point all cross-type AF system. This feature gives you an impeccable view using the viewfinder as it can lock on a moving image and take shots without marring or smearing of any form. Its dual-pixel autofocus is an excellent feature for live view and video mode. With dual-pixel autofocus, the camera is faster and more sensitive to movement. It comes with a 7,560-pixel + IR sensor which allows it to collect distinct color information for moving images. This makes it ideal for action and sports shooting when coupled with the 7fps burst shooting. This camera offers shooting of videos in 1920 x 1020 pixels at 50fps. It is a higher resolution than 1080 such that you can shoot videos in extreme conditions and still get good details and well-contrasted videos. It also offers you 2X slow-motion playback. This way, you can add some dramatic effects to your videos. Canon 80D gives you touch control on both the main and quick menu alongside the button controls. It is a super easy way of navigating the features since the controls are located in a simple-to-reach location on the right side of the camera. Canon 80D provides lovers of photography with an advanced camera with all the features to expect in a premium quality DLSR camera. It has a variety of exceptional uses from live action to low-light shooting, and sports events. If you are not open to making any compromises on a cheap DLSR camera, Canon 80D is the way to go. Why we like it: It is a weather resistant camera that will get you through rains and cold temperatures in bright and low light. 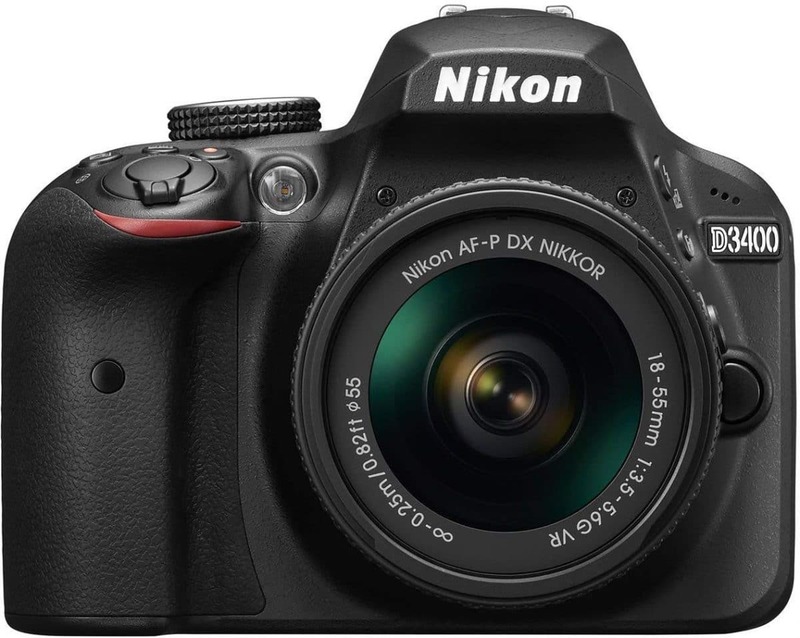 Nikon D5300 is an updated version of the Nikon D5200. It has all the crucial specs you need for solid imaging. It has a high-quality build such that it can withstand the rigors of the outdoors and still perform flawlessly. This camera features a 24MP APS-C CMOS sensor without a low-pass filter. It is at par with top performers meaning you get to enjoy bright images that are delightful in terms of the details. The camera uses two aspherical lenses that provide improved optical performance. The two lenses give it an edge over the Nikon D5200 when it comes to resolution. You will love that it has a wider 3.2-inch fully articulating LCD. This means you will be able to shoot from all angles. But it does not offer a touchscreen which is a limitation if you are about executing operations by touch. The main difference between this camera and the D5200 is that it does not have a twin-dial interface. The camera provides shooting of videos in true full HD at 1080/60p. Nikon D5300 has picture control modes to make your photos more detailed. It includes dynamic HDR and toy camera alongside seven other scene modes. It also offers you 16 scene modes for use when shooting RAW and JPEG images. We like the inclusion of Wi-Fi technology as it means that you can transfer files to your smart device and upload them on Instagram, Facebook, Whatsapp, and other social media sites. With the help of GPS, you can stamp locations and add your photos to travel maps. Nikon D5300 is a highly-ranking DSLR camera. It is equipped for the outdoors thanks to the articulating screen and effects modes. It has GPS and Wi-Fi functionality to open up possibilities for doing more with the photos and videos you capture. It boasts a small and lightweight body that will not make your hands ache after a long day of use. When you want better looking Instagram photos, upgrading to better equipment is a wise decision. DSLR cameras are not new to the market as they continue to improve amidst completion from mirrorless cameras. Basically, DSLR stands for digital single reflex lens. It uses a mirror to reflect the light that comes from the lens and transfers it to an optical viewfinder that’s why they use the word reflex. The mirror reflection allows you to see the image before you press the shutter button. The joy of owning a DSLR camera is that it can be used with different lenses. You can purchase the body and use it with a lens from a previous camera of the same brand in order to have more specs. Interchangeable lens come in handy when you need to shoot in different situations. With a DSLR camera, you get a big size lens, a wide range ISO, and decent megapixels. The result is detailed and brilliant images as you can shoot in different lighting conditions with ease. It is unlike what you would get with a point and shoot and most smartphones. The lenses on a DSLR camera give you a deep field of view such that it can blend in the foreground and the background into one amazing picture. Navigating the menu is perhaps one of the most challenging aspects of owning a DSLR camera. It can be a steep or smooth learning curve depending on the model you acquire. You will want to familiarize yourself with one brand when starting out as each of the major brands like Nikon and Canon have their own paths. If you are starting out in photography, the last thing you want is confusing yourself by using two brands at the same time. Here’s how to control the focus point on your Nikon or Canon DSLR camera. Some of us want to upgrade from a smartphone camera while others want to shoot in live events, and others want a good portrait. Many cheap DSLR cameras come with limited features and the cheaper it is the few features it has. When you want a camera that can shoot in extreme conditions, you will want to stretch your budget a little bit to have a camera that can accomplish your exact needs. Here, you will want to consider looking at the screen, grip, and overall build quality of the camera. You will want your camera to have a good LCD preferably an articulating one, but you can still do with one that does not rotate as long as you have a good view of your images.The grip will determine how comfortable it will be to use your camera. It should have a rubbery or rugged surface with well-designed buttons for easy reach. A camera that is weatherproofed is also a nice touch if you will be shooting in places where moisture and dust are inevitable. Taking care of your DSLR camera is a must if you wish to use it in top notch condition. Some cameras have inbuilt systems for cleaning the sensors and the lens which is a huge help. But you will still need to clean it so that no dust appears in your photos and videos. Scene modes come according to the brand of your camera. Some will offer six modes while others will go as far as nine or sixteen. The more modes you have, the better it will be in shooting in varied conditions. At the end of a long excursion, you will want to share your memories and your best work with family and friends whether one-on-one or on social media. Bluetooth, NFC, and Wi-Fi connectivity are important as they allow wireless transfer of files. And with Nikon’s SnapBrdige technology, files are shared automatically between shots. Investing in a DSLR camera is a big step. We have narrowed our top 10 list with the Best Cheap DSLR cameras that perform with excellence for the price. It’s our hope you find it enlightening as you pick up the pace in photography.